← Happy Birthday to Orville and Katharine Wright! 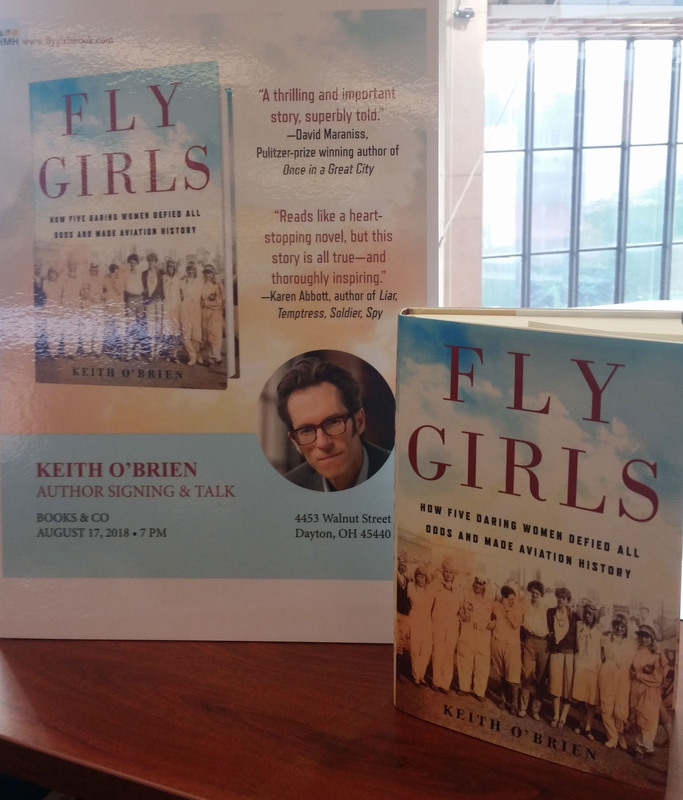 Fly Girls author Keith O’Brien in Dayton on August 17! If you are an aviation enthusiast and a book lover, you will not want to miss your chance to meet the author of the new book Fly Girls: How Five Daring Women Defied All Odds and Made Aviation History. Keith O’Brien will be at Books and Company at the Greene this Friday, August 17, at 7:00 p.m. to discuss his book. Keith O’Brien, author of Fly Girls, will be at the Greene Aug. 17, at 7 p.m. Fly Girls, just released August 7 by Houghton Mifflin Harcourt, tells the amazing and forgotten story of women pilots in the 1920s and ’30s—the story of women fighting for the right to race airplanes, winning that right, and then ultimately beating the men at their own game in the 1936 Bendix Trophy race, one of the most dangerous and celebrated races of them all. You can learn more about the book at www.flygirlsbook.com , and even see a video trailer for the book featuring archival footage. The book is receiving great reviews from Time Magazine, Publisher’s Weekly, People, Parade, the Boston Globe, St. Louise Post-Dispatch, and the Wall Street Journal. KEITH O’BRIEN is a former reporter for The Boston Globe and a frequent contributor to National Public Radio. He has written for The New York Times Magazine, Politico, and Slate. I manage preservation efforts in our department, which includes implementing our preservation plan, monitoring environment, assessing collection conditions, improving housing, and developing and implementing the electronic records program with the Archivist for Digital Initiatives and Outreach. I also catalog our manuscript collections, and manage the gift books and journals. Additionally, I arrange and describe collections, provide reference assistance, create exhibits, give presentations, and assist with special events as needed. This entry was posted in Outreach, SC&A and tagged Fly Girls, Keith O'Brien. Bookmark the permalink.